Appleton Extra is everything that was V/X, only older and more sophisticated. It’s darker, heavier, oakier. It’s a bit more brutal, and a bit more rewarding. In short, it’s a definitive trade up from V/X, which I still maintain to be a fine entry-level sipper. Appleton Extra is sweet and smells of wood and molasses, tasting much of the same. It’s rum – unblemished and uncomplicated. And that’s what makes it wonderful. I’ve never stooped to trying Appleton Special, and I’ve not yet forked out the cash for Appleton 21. 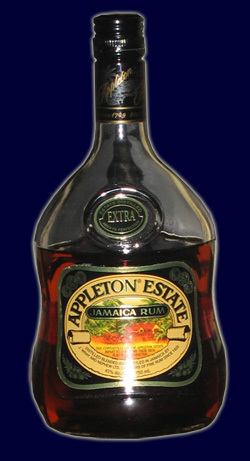 But for now, Appleton Extra is an excellent basic sipping rum. This entry was posted in Rum and tagged appleton rum, dark, dark rum by Bilgemunky. Bookmark the permalink.